How do I buy a Computer Troubleshooters Franchise? Computer Trouble Shooters is dedicated to helping business owners get more productivity out of their computer systems. Computer Troubleshooters know that as businesses and consumers continue to rely more on technology, they need experts who can ensure their computers, mobile devices, and networks will always be up and running properly. The vast service offerings and vendor relationships that Computer Troubleshooters provides, gives franchisees optimum revenue and profit potential in both the residential and commercial markets. The most successful franchisees have An entrepreneur's mind-set, are open to change and are able to adapt to advances in technology. 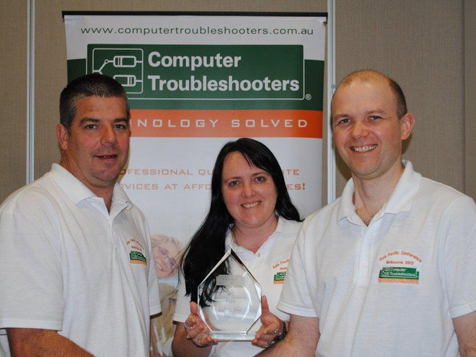 If you are interested in owning a business that makes a difference in your community explore Computer Troubleshooters today! Open Computer Troubleshooters in any of these available states: AL, AK, AZ, AR, CA, CT, DE, FL, HI, ID, IL, IA, KS, KY, LA, ME, MA, MI, MN, MS, MO, MT, NE, NV, NH, NJ, NM, NY, NC, ND, OH, OK, OR, PA, RI, SC, SD, TN, TX, UT, VT, WA, WV, WI, WY, DC. 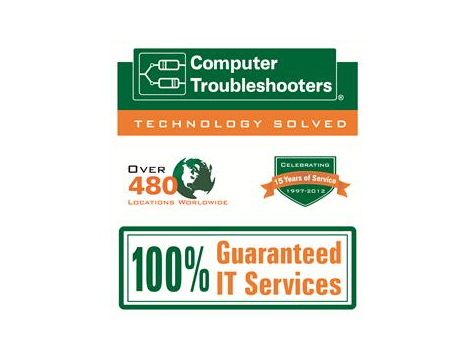 Computer Troubleshooters is the world's largest technology services franchise network. We know that as businesses and consumers continue to rely more on technology, they need experts who can ensure their computers, mobile devices, and networks will always be up and running properly. The vast service offerings and vendor relationships that Computer Troubleshooters provides, gives our expert franchisees optimum revenue and profit potential in both the residential and commercial markets. The IT Service Industry and technology is reacting to the rise of Cloud and Hybrid Cloud Services, Mobile Growth, and Outsourced IT Support in SMB’s. Computer Troubleshooters is taking a proactive approach to stay ahead of these trends and working with our franchisees to develop and help maximize revenue opportunities. According to a survey completed by CompTIA 62% of the organizations surveyed planned to make greater investments in Outsourced IT Services (managed services) over the next two years. Exceptional Vendor Relationships and Pricing – Our expanding vendor program will connect you with industry leaders that will help you provide first-class services to your clients, diversity in your product offerings, and discounted pricing that maximizes your profit margins. Initial New Owner Training – We provide a two day comprehensive on-site training that will prepare you to be a successful technology based business owner. Upon leaving training you will spend eight weeks being coached by an existing and successful franchisee with over ten years of experience working and making new franchisees successful. On-Going Training – We provide on-going training as new vendors and new vendor products emerge. We also host several live trainings on new product lines and marketing tactics throughout the year to make sure you are able to understand and utilize the initiatives that will help make you successful. 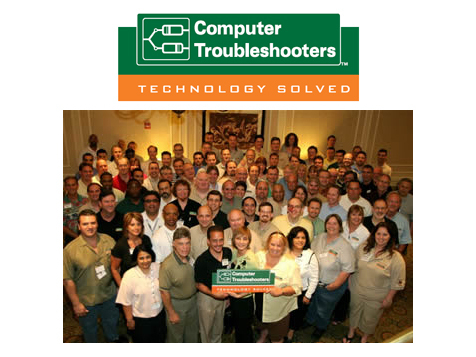 The most valuable training you can take advantage of is the interaction and knowledge exchange from the World-Wide Network Computer Troubleshooters franchisees. Complete Franchise Package – Our franchisees take advantage of our Office Infrastructure that includes a company branded website, email, and an automated office admin & billing system that gives you the ability to schedule appointment, track clients technology systems, manage system alerts when actions need to take place, and invoice clients. Resources to Make You Successful – Our Franchisee Intranet provides continually updated information on new vendor relationships, sales & marketing resources that can help increase your lead flow and how to effectively follow up and track leads, and a forum to interact and gain knowledge from fellow Computer Troubleshooters franchisees. Sales & Marketing Support - We work to provide full-circle proven marketing programs that work together to help maximize your market penetration. Some of the program options include a Telemarketing Program, an Email Marketing Program with provided monthly content, Social Media guidance and content, and Presentations that you can utilize at client meetings or networking events. Low Start-Up Costs – We provide flexibility to our franchisees allowing them to work from a home office instead of a costly storefront and the ability to take advantage of our vendor pricing immediately to help drive down initial start-up costs. Open to change and are able to adapt to advances in technology. Experience implementing and managing technology. Owning a business that makes a difference in their community. "truer words have never been spoken." Computer Troubleshooters is not currently active in our directory, but here are some other recommended selections for you to explore.